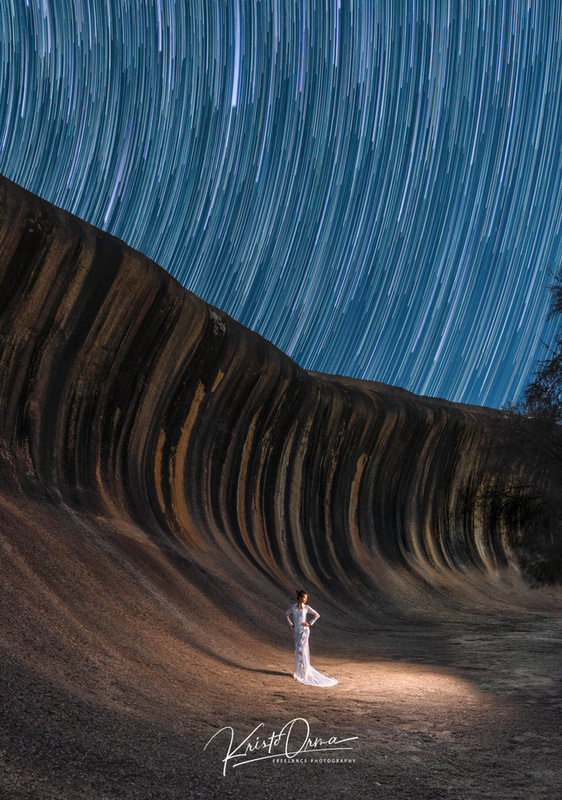 Wave Rock, Hyden, Western Australia. One of Australia's biggest waves is also the furthest from any ocean - Wave Rock rises 15 metres above the outback plain and its 110m long. Wave Rock has cultural significance to the local aboriginal people who believed that the rock was a creation of the Rainbow Serpent, and was created in his wake by dragging his swollen body over the land after he had consumed all the local water. To got this final image, first I did foreground shoot after sunset to get sharp foreground. Few hours later I started shoot stars and I spent doing this around one hour to get 125 shots. The model on this photo is my lovely wife wearing her wedding dress. Great "portrait" from a distance. Love the landscape and composition! Love how the lines of the stars lead to the lines on the wall that lead to the subject. Great work! Amazing idea and execution! Brilliant! excellent image. love the overall look.